Following up on the International Day for the Elimination of Racial Discrimination (21st March), and the International Day of Remembrance of the Victims of Slavery and the Transatlantic Slave Trade (25th March), UNESCO is happy to bring to you a series of fantastic initiatives of intercultural dialogue, that highlight the bridges that are built between marginalized communities whose members descend from enslaved people, and other communities who also found themselves marginalized because of their cultural identity. Today, we meet with Rafael Ramos, who has initiated the Schools of Knowledge and Rights project, in Colombia, aiming to build a bridge between the children from the Afro community and the Wayuu indigenous community. The different activities he organizes to create an intercultural dialogue among both communities enable not only the different groups of people to break down stereotypes and to deconstruct their prejudices about each other, but also to share ideas and good practices when it comes to the promotion and the defense of their culture, and rights. What were the observations that motivated the creation of this initiative? The motivations behind the Schools of Knowledge and Rights project were multiple, but two major elements drove the idea: to strengthen cultural practices of identity, that had weakened the self-recognition of children Afro and Indigenous identity; and to create spaces for dialogue and transmission of the ancestral knowledge, from the greatest knowledgeable people and ethno-educators / teachers to the children and teenagers. How did the implementation of the project start? We identified two vulnerable communities, the Afro peasants, affected by the Colombian armed conflict, and indigenous communities of the Wayuu people, who have problems of exclusion and social neglect. In both communities, it was clear that there were common problems, notably regarding the promotion of their culture. Therefore, we thought that shared reflection on resilience, and collaboration on similar challenges, could be a smart entry point to build intercultural dialogue. How was the collaboration with the different counterparts? How did you gain trust and bring them on board? There is a great annual meeting of 3 days where each community exhibits the results of all the actions carried out and shows the progress in strengthening their practices. During these meetings they cook and share the food of each community; scholars and traditional know-how leaders are invited to raise the reflections that are taken into account in public policies. Tell us more about these inter-ethnic activities! They are gatherings, creating spaces where each ethnic group exhibits and shares their knowledge in a recreational, participative, inclusive and playful way. They are spaces where you learn while playing and enjoying. The elderly participate and the children have the opportunity to learn, value and encourage a sense of respect for the ethnic differences of other communities. Teachers participate with the intention of expanding their knowledge and then apply them in their lesson plans. Boys and girls have the voice and leadership to talk about the cultural manifestations that identify them as an ethnic population group. Farmers’ products, dances, instruments, games of each community are shared and ties of inter-ethnic cooperation, and common agendas, are strengthened. Beyond the celebration of cultural diversity, such gatherings enable to tackle very specific challenges that both communities are facing, therefore they can also exchange ideas, good practices, correct? Indeed, these gatherings are the occasion to tackle a variety of challenges, such as What kind of strategies do Afro and Indigenous communities implement to guarantee ethno-education or self-education? What forms or models do Afro and Indigenous communities apply to strengthen the cultural practices of music, dance, the native language, their own economy, traditional cooking among their children? What are the ways to produce food in Afro and Indigenous communities? How do the Afro and Indigenous communities appropriate the tools to defend their rights to the territory? Your initiative not only does allow children to discover the culture of others, but it also enables them to be proud of them! The people after each encounter are full of emotions sustained by the lived experience and highly grateful for the learning. After the meetings, they have a greater sense of appreciation and respect for the different ways of life of the other communities. It is also true that people return to their communities, after each encounter, valuing their own cultural background, and with greater responsibility when to, for example, the use of water, food, the care that is needed to preserve their own culture, etc. What are your future plans to strengthen intercultural dialogue? Integrate other communities? Go to other parts of the country? Inter-ethnic encounters are very expensive and we do not have the resources to do more than we are doing at the moment. In our future plans for the strengthening of the project, it is a priority to apply for calls for incentives and assistance to continue these activities. We would like to include other communities that have significant experiences and problems: new synergies can be created, to shape new solutions together. 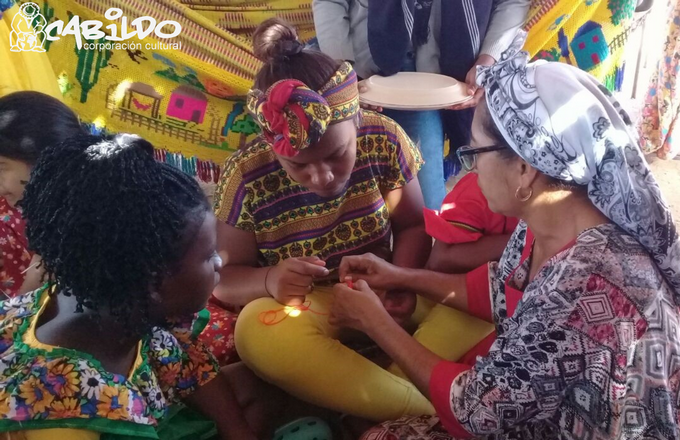 We would like to make inter-ethnic encounters with other regions of Colombia, for example, Afro and Indigenous communities of the Colombian Caribbean, with Afro and Indigenous communities of the Pacific. We would like to invite Afro and Indigenous leaders who have climbed positions for their social and political activism as our guests. We would like to know and share our experience with other Afro and Indigenous communities in other countries. Many more challenges and adventures to come!